When You need a new toilet replaced , installed contact M.A.C. Stewart Plumbing. We install and repair and supply toilets and bidets. We also can service and repair your old toilet. Installing a new water saving toilet can be a step in the right direction when it comes to making your home a greener, more energy efficient place. Water-saving toilets can conserve up to 60% of your current toilet’s annual water usage. We have carefully researched and selected the best toilets we believe to be with regards to performance, quality, price and design. We’ve done all the research for you. It doesn’t have to be complicated. Let us bring a home shopping experience to you. All new toilets come with a written warranty! The toilet is one of the most important fixtures in your home. Although toilets are sturdy and reliable components of the plumbing system, it’s a rare homeowner or apartment-dweller who never has any problems with a toilet. Clogging is perhaps the most common toilet trouble, but it is far from the only one. The tank, for example, can make all sorts of strange noises, or water can run continuously. Fortunately, there hard to install for an average homeowner. Most toilets have separate tanks and bowls, making them two-piece, but many higher-priced toilets are one-piece, and generally more stylish. This is a style preference. One piece toilets tend to cost significantly more. Most bowls in residential installations are round; in commercial installations they are usually elongated. Many residential toilet bowls are made in elongated versions as well; you just have to ask for them. With an elongated bowl, you get an additional two inches in front. That means a larger target area and less drip on the bowl. What are common signs that you need to replace your toilet? If the porcelain is cracked on any part of your toilet, it should be replaced. Not only is a crack unsightly, it can also be dangerous. A crack can easily become a break, and if the toilet is being used at the time it breaks, the sharp edges of the broken pieces can cause severe injuries. Cracks can also leak and cause damage to the floor and sub-floor. Outdated toilets should be replaced. 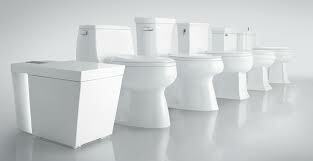 Older toilets usually use much more water than a new toilet, roughly 3.5 gallons or more per flush. All new toilets should only use a maximum of 1.6 gallons of water per flush. New toilets are specifically manufactured to operate efficiently using a significantly lower volume of water. It is often more expensive to update an older toilet then to replace it. If you're planning to remodel your bathroom, this is a good time to replace your old toilet. Hard water carries minerals that will leave deposits in your tank and bowl. Besides being unsightly and difficult to clean off, these deposits can clog the ports around the bowl's inner edge and affect the way it flushes. The deposits can also collect at the main port above the drain hole, causing an incomplete flush. The drain hole itself can become so obstructed that the toilet will clog more easily. Hard water deposits that collect inside the tank on the flapper and flush valve will cause the flapper to lose its seal and water will continuously leak into the bowl, wasting water and running up your water bill. With the wide range of toilet designs available today, it is often a good idea to have your toilet changed out with one that suits your personal tastes or need for improved comfort. What are some safe and professional solutions to clogged toilets? A program of preventive maintenance with a professional plumbing company, will reduce the frequency of clogged toilets and possibly eliminate the problem altogether. Have trees removed from above and around your underground waste lines that might be contributing to your clogged toilets or could potentially do so in the future. What are some easy tips to avoid clogs? Don't use too much toilet paper. This can cause a clog in the toilet or build up in your waste line.